I noticed today that putting a Raynox DCR-250 in its standard adapter onto the front of a Canon Macro Lens EF 100mm f/2.8L IS USM produces a combo that can be tuned to be perfectly telecentric. The magnification at this setting is roughly 1.69X, 13.2 mm across my T1i sensor. The very corners of the field are astigmatic at f/11, but there's a high quality center about 10mm x 6.6mm. At f/16 the corners come in pretty good but the whole image is less sharp. This looks like a useful combo for stack-and-stitch in the range of say 10x13mm (2 frames) up to several times that. I haven't done that yet, though. Edited to add: Increasing separation between the Raynox and the Canon allows this combination to work down to 0.8X with high quality across the field, as described below. I was looking for a telecentric lens on eBay and the ones listed were priced above what I'm willing to pay for testing purposes. I don't have the method to test the telecentricity with alternative settings, but I wonder if with the use of extension tubes the combo will remain telecentric. I wonder if with the use of extension tubes the combo will remain telecentric. Yes, it will. Telecentricity is determined only by lens elements in front of the physical aperture. This is because only those elements affect where the aperture appears to be. With a very high risk of revealing my lack of understanding of telecentric optics, I have a couple of questions. Would this method be adaptable or suitable to my (non-IS, non-L) Canon 100mm macro lens and a FF 5DII camera body? 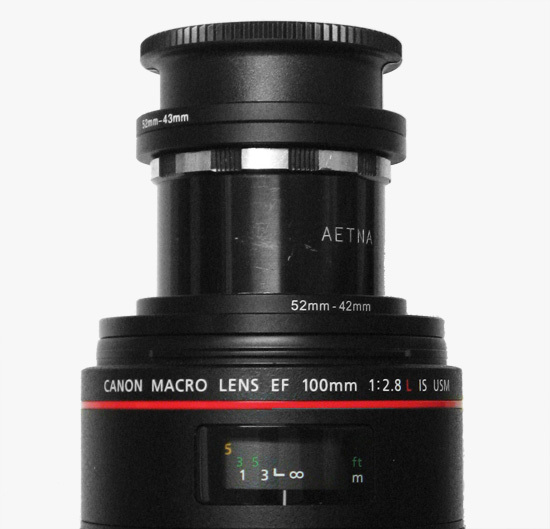 This is the generation of Canon macro lenses that has internal focusing, not the previous generation without this feature. Also, how low in magnification can one go with this optical system? Is it restricted to approximately 1.69X, regardless of other adapters or lens "filters" that one might add? For example, would additionally using a wide-angle add-on filter provide reasonably high-quality lower magnifications? As always, please forgive my ignorance of so many of the key technical issues involved here. Phil, you have asked some excellent thought-provoking questions. The short answer is "it depends", and unfortunately what it depends on is details of your lenses that I don't know. But perhaps I can summarize the issues so that you can do your own investigation. The defining characteristic of optics that are telecentric on the object side is that the axes of the entrance cones are parallel to the optical axis. This immediately restricts the diameter of the subject field to be no larger than the diameter of the front lens element, minus the diameter of the entrance cone at that point. The Raynox DCR 250 has glass about 35 mm diameter, so that's the absolute limit using that lens. When you construct a telecentric combo by adding a positive achromat in front of another lens, then what's needed is to place the added achromat exactly its own focal length in front of the entrance pupil of the other lens. With the Canon 100mm f/2.8 L and the Raynox DCR 250, one way that happens is when the lenses are mounted and focused as shown above. 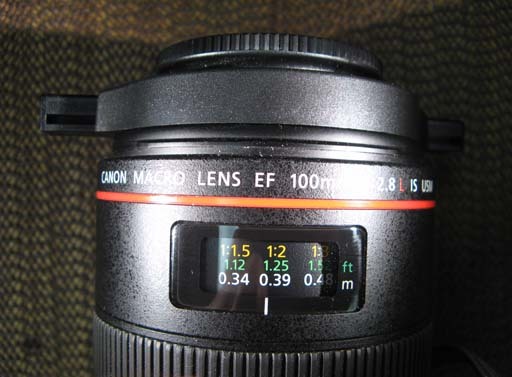 So, on my Canon T1i, the answer is 0.8X for the question "how low in magnification can one go with this optical system?" With other cameras and lenses, the same question would have other answers. I have no idea where the entrance pupil is for other lenses, and the fact that your full-frame camera will cover a wider field at the same magnification will also factor in. If you want to play with this stuff, I suggest reviewing my thread on Telecentric optics, third round. There's a lot of discussion there, and the setup described by Ulf may bear directly on your question. Edit: For future reference, the adaptor stack in back of the Raynox is described by seta666 in THIS thread. Would this method be adaptable or suitable to my (non-IS, non-L) Canon 100mm macro lens and a FF 5DII camera body? How high can the magnification go with this optical system? (APS-C).....I did see the title of the thread but wanted to clarify. Should the suggested extension between the front of the 100 L and Raynox 250 remain the same as outlined above through the entire range of focus/magnification? Are the initial downsides mentioned in your original post still applicable after the additional extension of 44mm was introduced? Can I happily assume the magnification between the highest and lowest are also of acceptable optical quality and are there any "limiting factors" of which to be aware....and if so, what is/are their visible signature? Craig, I have not confirmed the following replies by experiment, but I'm pretty confident I have them correct. How high can the magnification go with this optical system? With this particular pair of lenses and adapters, the upper limit is 1.69X as indicated in the title. It could be driven a little higher with a different adapter that would push the Raynox into contact with the front of the lens. It could also be driven a little higher simply by allowing the optics to go slightly non-telecentric, but not so much as to cause problems. See http://www.photomacrography.net/forum/viewtopic.php?t=1472 for a discussion of that issue. Adding a teleconverter behind the 100L would increase the magnification without affecting the telecentricity. I know that the Teleplus Pro 300 1.4X teleconverter works well with the 100L, as shown in the funnel web images HERE. That combo would give up to 2.37X, still with the astigmatic corners. One could also add extension behind the 100L, again without affecting the telecentricity. I haven't tried this so I don't know what tradeoffs might be encountered. For even higher magnifications it would be better to switch lenses. The MP-E 65 plus a 40-50 mm focal length achromat can be telecentric around 5X. The Raynox needs to stay the same distance in front of the 100 L's entrance pupil. The 100 L's entrance pupil moves smoothly backward as it changes focus, so to remain telecentric the front extension would have to be changed to match. I presume you're referring to my comments about astigmatism in the corners. No, those go away at the lower magnification described in the latter post. That's what prompted my comment that "Even more conveniently, image quality remains high clear to the corners." That's why Phil's question was so helpful to me -- I had initially been thinking that the combo was only good up to about 12 mm diagonal, but actually it's good to more than 30 mm diagonal by pushing out the Raynox and reducing magnification on the 100L. Starting with everything clean in the 0.8X configuration, and working toward the 1.69X, I would expect the corner astigmatism to appear gradually as magnification is increased and extension decreased. Other than that I would expect no problems. Or do I miss there something? It varies depending on the lenses you have available, the magnification you want to work at, and the tools/parts/skills you have for DIY. Adding an iris is actually the first approach I worked with, but since then I've come to prefer the added lens in many cases. One issue is that the front lens element has to be at least as wide as the telecentric field, and large diameter achromats are cheap and common compared to fully corrected camera lenses with the same effective diameter. The setup shown at the link you provide benefits greatly from the huge diameter of that 85 mm f/1.2 lens that it mentions. A second advantage is that the added lens approach preserves full connectivity between the main lens and the camera, including all metering modes. For cases where the added iris approach is preferred, I like your method of building it into a camera-specific extension tube. Alternatively, one can now buy off the shelf an iris in standard M42 mount that could be used in a similar way with other lenses. With such a commercial tube with iris inside it is probably a problem when the iris is not in the register distance - no telecentric perspective. 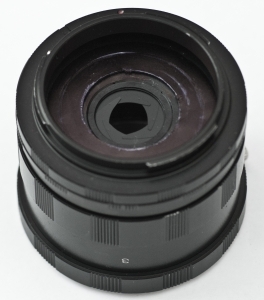 To get the lens automatism one could use normal expensive extension tubes and build a (probably removable) iris inside. Such will get lens a bit more automatic work. But for this way it would not be helpful, cause lens should be focused to infinity (to have telecentricity) and iris of the lens should not be closed to be active in the path of light. Probably IS could be useful. With the Canon EF 100mm f/2.8 one has up to ~35mm field - not sure whether the iris is still outside the camera mirror box. Wouldn't it be possible to take an old manual lens and remove the actual lenses from it to get a tube with a diaphragm inside it? That diaphragm would still be operated by the camera. You just need to figure out a way to attach the actual lens to this and to keep the proper distance. Possibly use a reversal ring. If you were lucky you might find the iris in an old zoom lens could be used, with all the glass removed. The iris often moves a lot as you zoom. Luck could play quite a large part though! I think a zoom lens' tube is too long for most camera's register lenght. You can still use the focus ring to fine-tune the distance (I'd rather have it fixed, though...). I've found a friendly photo shop owner who was able to make me a spacer with an embedded diaphragm from an old teleconverter. He made an adapter on top of it so that I can attach any lens. I've attached my Sigma 105mm lens and - as predicted - the part of the sensor that has a sensible image is rather small. I've then added a stack of spacer rings and now the whole sensor area gets used. Total magnfication is roughly between 1:2 to 2:1. Of course I lose a lot of light by this construction. Any suggestions for a test setting?